H. Richner and P. Heeb, Is the Information Center Hypothesis a Flop? C.L. Moore, Maternal Contributions to Mammalian Reproductive Development and the Divergence of Males and Females. J. Terkel, Cultural Transmission in the Black Rat: Pine Cone Feeding. A.E. Magurran, B.H. Seghers, P.W. Shaw, and G.R. Carvalho, The Behavioral Diversity and Evolution of Guppy, Poecilia reticulata, Populations in Trinidad. S. Creel and D. MacDonald, Sociality, Group Size, and Reproductive Suppression among Carnivores. A. Fogel, Development and Relationships: A Dynamic Model of Communication. L. Keller and H.K. Reeve, Why Do Females Mate with Multiple Males? The Sexually Selected Sperm Hypothesis. J.A. Mather, Cognition in Cephalopods. Chapter References. Subject Index. Contents of Previous Volumes. Advances in the Study of Behavior continues to serve scientists across a wide spectrum of disciplines. 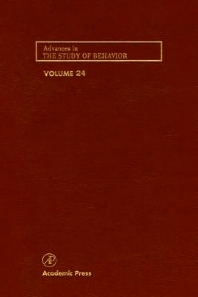 Focusing on new theories and research developments with respect to behavioral ecology, evolutionary biology, and comparative psychology, these volumes serve to foster cooperation and communication in these diverse fields.